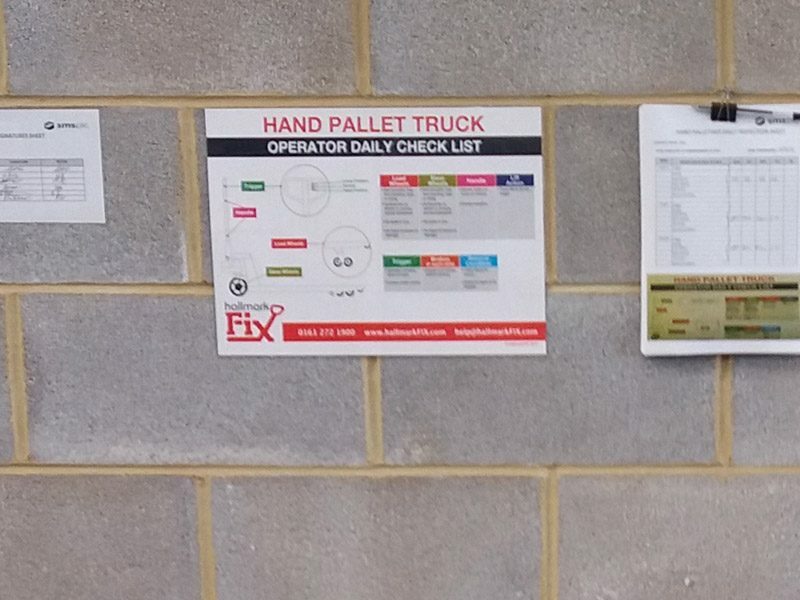 We’ve put together a handy guide to a daily inspection for pallet truck operators – download it below, print it out, and stick it up wherever your pallet trucks are stored or used! Pallet trucks are often treated more disposably than they should be – with a small amount of care and maintenance, they can last a surprisingly long time. In addition to the annual inspections required under HSE regulations, carrying out a daily check before use is a great way to make sure they remain in good working order, and that they’re safe to use. This simple chart outlines a few simple checks that truck operators can make on the wheels, handles, lift action, trigger and brakes before starting work. They’re all really simple – the checks can be carried out in just a couple of minutes – and will help you identify problems that can be repaired early on, avoiding unsafe, costly and productivity-disrupting breakdowns. Get your free PDF checklist now! If you’d like a copy, just fill out the form below and we’ll email you a PDF that you can print out. If you’d like a hard copy, just check the box and enter your postal address – we’ll send an A3 version out to you free of charge (UK only). We’ve got your pallet truck needs, whatever they may be, totally covered. As well as selling new pallet trucks, all with a three-year warranty, we provide full maintenance and repair services, all at a great value. Repairing and recycling old trucks is far cheaper than buying new – find out by just how much! Annual inspections are a legal requirement. We make sure they're affordable and hassle-free.